Boies Schiller Flexner has elected three lawyers, from offices in New York, California, and Florida, to its partnership. 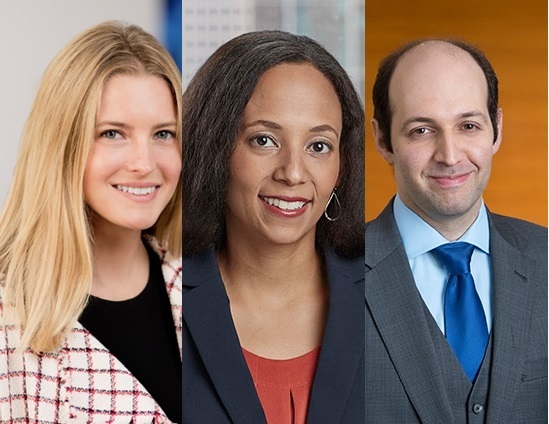 “We are proud to announce our immensely talented new partners, Julia Bredrup, Ben Margulis, and Sabria McElroy, who already have a track record of success for clients and demonstrate the firm’s strength from coast to coast,” said Managing Partner Jonathan Schiller. Julia Bredrup is based in the Los Angeles office. She has represented clients in cases involving securities violations, malpractice and professional liability, healthcare, insurance coverage, partnership and shareholder disputes, employment, copyright, entertainment, civil rights, and environmental issues. Her civil practice includes both plaintiff- and defense-side representation at the trial and appellate levels. On the criminal side, she has represented clients in both state and federal courts at every stage of investigations and charged proceedings. Julia is also an active participant in the firm’s pro bono program. Ben Margulis is based in the New York office. He specializes in intellectual property matters that implicate principles of free expression and fair use. He joined the firm in 2013 and has represented clients from a variety of industries in matters arising under the Copyright and Lanham Acts, state unfair competition and defamation laws, and federal securities and trade laws, as well as in matters involving common law fraud and contract principles. Sabria McElroy is based in the Fort Lauderdale office. She has a wide range of experience representing both plaintiffs and defendants in antitrust, class actions, legal malpractice, securities litigation, and international arbitration. Her past achievements include the representation of a large public company against a class action seeking tens of millions of dollars in damages, in which the court denied the plaintiff’s motion for class certification. Before attending law school, she taught seventh grade English and Social Studies at a public school in north Philadelphia. The elections took place at the firm’s annual meeting on December 7. In addition, Andrew Beyda (Miami), Shira Liu (Santa Monica), Noah Peréz-Silverman (Los Angeles), Prateek Swaika (London), and Juan Valdivieso (Oakland) were appointed counsel.